This simple vegetarian recipe can be made in less than 20 minutes--perfect for any day of the week, including Friday! 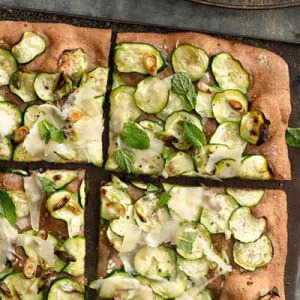 A whole-wheat crust gives this green pizza a nutritious base. The pie is layered with thinly sliced zucchini, which provides vitamin A and is low in calories; scallions; and a bite of Parmesan cheese. Sprinkle mint leaves on top for a fresh flavor. Enjoy two slices for just 325 calories.